With Days Like These Martin Leroy puts the viewer into the shoes of Dan, a young Aboriginal man trying to find work. As we follow him through the day we get a feeling of what it means to be black and to cope with disappointments and social stereotyping. Filmed in Sydney and Redfern, Days Like These is a compelling snapshot of urban Aboriginal life and its daily challenges. Director Martin Leroy Adams says about his film: "This film is to highlight the struggles Aboriginal people face due to institutional racism and how that can result in a lack of opportunities. Many Australians don't believe they are racist, but many still hold true to their racial stereotypes of other cultures. 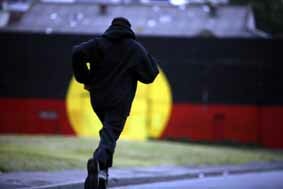 "Unfortunately for Aboriginal people, many perceive us in a bad light - lazy, criminalist, drunk or just plain untrustworthy. How's a brother gonna get ahead when everyone is putting him down? How are you supposed to get out of a gutter when everyone else thinks you belong down there? Still from the film 'Days Like These'. The backdrop is Redfern's The Block area. The film features a short scene of The Block in Redfern.